Q: The Chilean government has asked anti-trust regulators to block the sale of 32% stake in the Chilean lithium company SQM to a Chinese firm on the ground that it would give it an unfair advantage in the global race to secure resources to develop electric vehicles. What is China's opinion on this? A: I believe what you just described is an individual commercial case. At the Foreign Ministry's regular press conference, we rarely make specific comments on individual commercial cases. I am also not aware of the situation and would refer you to competent authorities. With regard to China-Chile relations, I want to stress that China and Chile are comprehensive strategic partners. Recent years have witnessed the smooth development of bilateral ties and fruitful outcomes brought by the friendly and mutually beneficial cooperation in various areas. 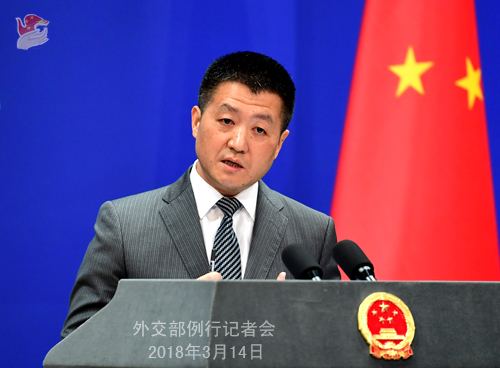 China will work with Chile to find ways for better cooperation in the relevant field under the principle of mutual benefit and win-win outcomes and elevate the China-Chile comprehensive strategic partnership under the new circumstances to new heights for the benefit of the two peoples. Q: What is China's comment on US Secretary of State Rex Tillerson being fired? The succeeding Secretary of State Mike Pompeo is more tougher on the US relations with China and the DPRK. Is China concerned that this change will add more uncertainty to China-US relations and the Korean Peninsula issue? A: We have noted this personnel change of the US administration. Secretary of State Rex Tillerson is about to leave office. During his time in office, Mr. Tillerson has been in close communication with the Chinese side and we commend his efforts for developing China-US ties. We hope that Mr. Tillerson would remain committed to supporting China-US ties in the future. As for China's expectation for China-US relations after Mr. Pompeo takes office, we have noted that President Trump has nominated Mr. Pompeo to the post of the Secretary of State. We would like to work with the new Secretary of State in following the important consensus reached by the two heads of state, upholding mutual respect and mutual benefit, focusing on cooperation while properly managing differences, and ensuring the sound and steady development of China-US relations, which not only serves the fundamental interests of the two peoples but also meets the general expectation of the international community. 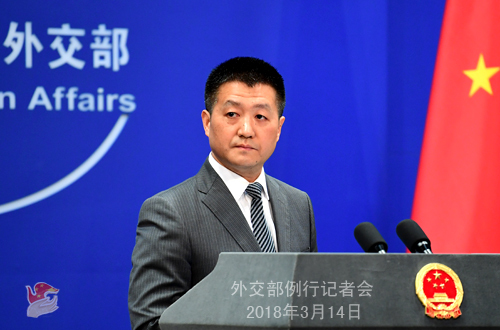 As for China-US cooperation on some major bilateral areas and international and regional hotspot issues, we believe that such cooperation has come a long way because it agrees with the interests of both China and the US as well as the expectations of the international community. We have every intention to sustain such cooperation momentum with the US. Q: It is reported that the Chinese business community in Papua New Guinea has lent a very helpful hand to the earthquake-stricken areas in that country, and a Papua New Guinean minister expressed his thanks for their disaster relief assistance. Could you give us more details? A: Since the strong earthquake hit Papua New Guinea in late February which caused heavy casualties and property loss, the Chinese side has been closely following the situation there. President Xi Jinping has sent message of condolences to Governor-General of Papua New Guinea Bob Dadae. The Chinese government and the China Red Cross Society have delivered emergency humanitarian assistance to the Papua New Guinean government and people. The Chinese business community in Papua New Guinea also pitched in by voluntarily joining the local disaster relief work or by donating money and goods. My information is that the China Railway Construction Engineering Group operating in Papua New Guinea swiftly mobilized their staff and equipment to join the emergency work. They helped clean up collapsed roads, including the highway between Mendi and Kandep, two major towns in the quake-stricken areas, ending a 15-day lockdown that about 5000 local people have been subject to since the quake hit. In the time of great difficulty, the Chinese enterprises stood with the Papua New Guinean people to tide over this crisis together, which demonstrates their strong sense of social responsibility and humanitarian spirit. Their efforts have won them wide acclaim from the Papua New Guinean government and people. The minister of its engineering department expressed his special thanks. China will continue to offer its best support to the Papua New Guinean side to help them overcome the difficulty and rebuild their homes. Q: According to reports, on March 13, Nepal held its presidential election, and incumbent President Vidya Devi Bhandari was reelected. What is your comment on this? What are China's expectations for the future of China-Nepal relations? A: China congratulates Ms. Bhandari on her re-election as the President of Nepal. We hope that under the leadership of President Bhandari and the Nepali government, Nepal can score greater achievements in its national development. China is Nepal's friendly neighbor. We attach great importance to developing ties with Nepal and stand ready to work together to deepen mutually beneficial cooperation and deliver more benefits to the two countries and two peoples. Q: The United States is reportedly seeking to impose tariffs of about 60 billion dollars on Chinese imports, mainly targeting technology and telecommunications sectors, according to people close to the sources. Is China concerned about potential new tariffs and are there any retaliatory measures planned? A: We have noted the relevant reports. Actually, whether it is about the issue of China-US economic relations, or the measures taken by China to protect intellectual property rights, the Ministry of Commerce officials have repeatedly talked about them over these days. Regarding any potential measures the US may take, as disclosed by relevant sources, I would refer you to the competent Chinese authorities. What I want to highlight here is that economic cooperation does not necessarily mean two parties competing and undermining each other, and it should never be a zero-sum game in which one's gains will definitely be another's losses. We have stressed many times that China is firmly opposed to any unilateral trade protectionism. If the US does take the steps and harm China's interests, we will definitely take measures to safeguard our legitimate rights and interests. Meanwhile, I must say that the China-US economic cooperation is mutually beneficial in nature. Over the past forty years or so, the growth of China-US economic cooperation has delivered tangible benefits to the people and enterprises in our two countries. It is normal for China and the United States, the top two economies in the world, to have some differences and frictions in economic cooperation. What matters is to manage them in a constructive manner, make the pie of cooperation bigger, and properly address each other's major concerns so as to achieve sound and steady development of bilateral economic cooperation. Q: Another question about the imminent departure of Secretary of State Tillerson. Is China concerned that his replacement may affect the upcoming US-DPRK talks? Is China concerned about the new Secretary of State's possible impact on the nuclear deal with Iran? 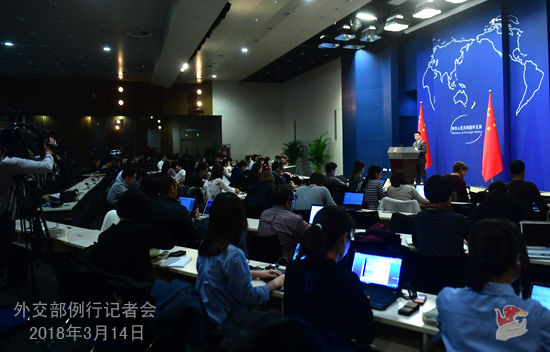 A: Like I just said, we hope that this personnel change will, at least, have no impact on China-US relations and bilateral cooperation in major fields. You asked whether this change may impact the recent positive interactions between the US and the DPRK. China's position is that we hope that the positive momentum of the Korean Peninsula situation, including the US and the DPRK demonstrating political wills to engage in direct talks, could keep going. I said yesterday that all relevant parties need to start and keep talking till something good comes out of the talks and a peaceful, stable and denuclearized Korean Peninsula is realized. As for whether the nuclear deal with Iran will be impacted, we believe that the Iranian nuclear deal is an important one reached by the P5+1 and Iran, accompanied by the strenuous efforts of the international community. It stands as a model of the international community working together to resolve the non-proliferation issue through political dialogues. We hope that all relevant parties could continue to implement this deal strictly and faithfully, since it meets the international non-proliferation endeavor and the common interests of the international community. Q: On March 14, renowned British physicist Stephen Hawking passed away at age 76. What is China's comment on Mr. Hawking? A: Mr. Hawking was a renowned scientist who had not only made immense contributions to the scientific world and mankind, but also long been persistently fighting a courageous war against illness. My knowledge is that he made three trips to China during his lifetime when he met with Chinese leaders and engaged in pleasant talks with Chinese scientists and his fans in China. Mr. Hawking kept track of China's development and spoke very highly of China's scientific progress. He was also a big fan of Chinese culture. He was once so determined on making to the top of the Great Wall and then finally made it with the help of his assistants. We mourn for the passing of Mr. Hawking and express our condolences to his family. I believe that Mr. Hawking and his legacy will be remembered forever.